Services like SparkPost let developers offload the operational considerations of building and hosting email infrastructure. We deal with the challenges of sending email at scale, the arcana of sender authentication, and the weeds of email deliverability so you don’t have to. Nevertheless, if you’re building email into your app or business process, email presents a number of messy details and idiosyncrasies that turn out to be “gotchas” for many developers. That’s why we put together this guide: we’re big believers in helping developers get the most out of email—and to be forewarned about email bugbears is to be forearmed. At SparkPost, #WeLoveDevelopers. Whether it’s a simple web app or a complex enterprise business process, we make it easy for developers at companies of all sizes to build email into whatever you’re coding. 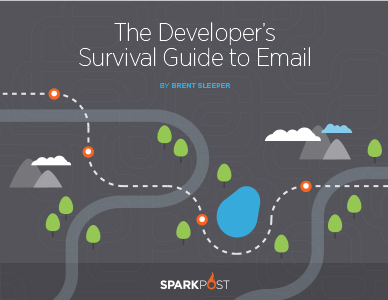 Download “The Developer’s Survival Guide to Email” and get started building something great with email today!